Zika virus particles, in red, found inside the kidney cells of an African green monkey. A devastating viral disease could actually help treat and prevent brain cancer in the future, suggests yet more research, published Tuesday in MBio. Researchers at the University of Texas Medical Branch and elsewhere successfully used a modified version of the Zika virus to selectively kill off certain stem cells that allow brain tumors to stay alive, at least in mice. Primarily spread by mosquitoes, Zika had long been considered a minor nuisance. For decades, following its discovery in the 1940s, it sporadically appeared in Asia and Africa. And when it did show up, it only occasionally caused flu-like symptoms in those infected. But starting in 2015, massive outbreaks of Zika raged across South and Central America, and parts of North America. Most people who caught the virus this time around were left no worse for the experience, but it was soon discovered that Zika could sometimes cause severe birth defects in children whose mothers had contracted it during their pregnancy. These congenital conditions vary from person to person, and can include blindness, deformed limbs, and microcephaly, or a smaller-than-normal head. But they all seem to stem from brain damage caused by the virus. The researchers behind the current study, led by geneticist Pei-Yong Shi of the University of Texas Medical Branch, have been researching Zika virus and its close viral cousins for years now, hoping to better understand how and why the virus attacks the fetal brain. 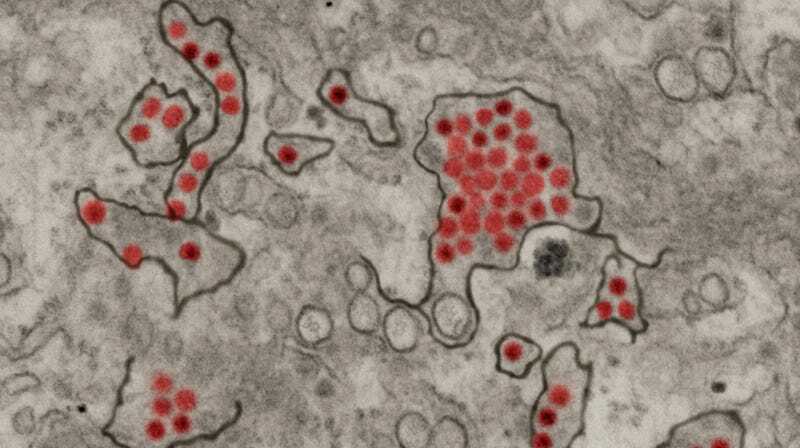 Unlike related viruses such as West Nile, Zika virus prefers to infect a certain type of cell found in the fetus known as a neural progenitor cell, their work has shown. And this infection kills off and prevents the normal growth of these cells into fully mature neurons. While their research has largely focused on developing treatments against Zika—no such drug exists currently—they also began to wonder if Zika’s picky appetite could be used for good. The deadliest form of brain cancer, called glioblastoma multiforme (GBM), is virtually incurable, with less than five percent of patients surviving five years after their initial diagnosis. Much of what makes GBM deadly is its tenacity: Tumors almost always grow back following surgery and chemotherapy. It’s thought by some scientists that GBMs rely on a specific type of stem cell to restock their ranks, known as glioma stem cells. And because these cells bear an uncanny resemblance to the same cells Zika goes after in the fetus, Shi and his team have theorized the virus could be retooled as an anti-cancer weapon. In earlier research, they found that a typical strain of Zika, injected directly into the brain, could prolong the lives of mice who developed a form of GBM. But because Zika can still be dangerous to adults, they wanted to work with a more neutered version of the virus. As it happens, researchers have been hard at work creating such strains, hoping to develop a vaccine for the disease. So in their latest experiments, they tested out one of these vaccine candidates. In mice bred to have no working immune system, the vaccine Zika strain was found to be harmless, causing no noticeable damage to the brain nor altering the mice’s behavior. It even seemed to be safer than a live-virus vaccine for Japanese encephalitis, another mosquito-borne virus that goes after the brain. And in mice that had human GBMs grafted onto them, the weakened Zika was still able to seemingly kill off stem cells and prolong the mice’s lives. Zika isn’t the only virus that’s been eyed as a potential brain cancer treatment. Like Zika, the viruses that cause measles and polio also selectively target certain brain cells. And human clinical trials of these viruses—similarly using weakened vaccine strains—are already underway in brain cancer patients and have shown some promise. Shi and his team plan to continue unravelling the mystery of Zika’s unique taste for brains. Understanding that will not only allow scientists to develop new treatments for Zika, but perhaps also create even safer and more potent brain cancer treatments. “We want to train the virus to do even better,” Shi said.